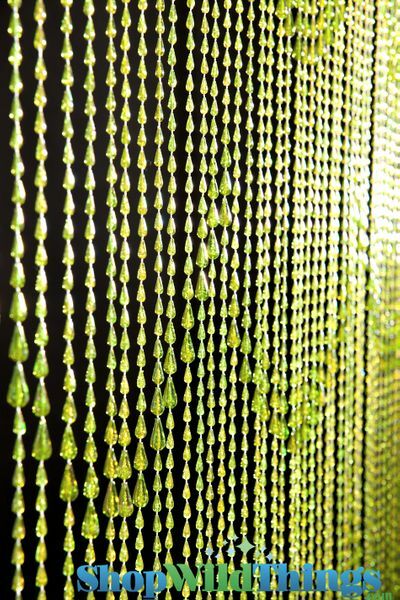 Lime Green Raindrops Beaded Curtain with iridescent (pearlized) coating. 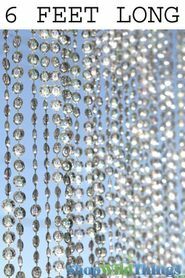 This beaded curtain has 45 strands and measures 35" x 72". Looks great with our lime green canopies and pom-pom blankets! Place two together right next to each other to cover wider spaces. Cut them shorter for the perfect fit if needed! Beaded Curtains are the hottest design trend out there right now. Use them in a doorway. Use them in the windows. Use them behind a bed suspended from the ceiling. Leave them hanging down, or tie them to the side like a regular window treatment. Add some wonderful color and fun to any room today with this fun lime green beaded curtain. I'm so pleased with my purchase. It's exactly right. I live in Australia, so I was a little worried about ordering online, yet the curtains (I ordered two) are fantastic. Also very handy, were the hooks I ordered. They made hanging the curtains so easy. Your online video was what really influenced me to buy. Plus - EXCELLENT customer service. I was kept informed of the Tracking every step of the way. Great for peace of mind. Thank you to the store and I shall certainly be ordering more items from you. I trust you 100%. Got these to replace our old "ice pops" beads from this store had faded and worn out after 15 years in the Santa Fe sunlight! They make beautiful high quality beads at very reasonable prices. This particular style reminds me of rain in its soft and shimmery look, as well as the shape of the beads looks like raindrops. The lime green is bright but soft and the iridescent finish makes them sparkle in the sunlight. Love them! ProsEasy to hang, good quality, great price. Our old ones held up very well, probably would last forever if not in the sun! ConsAlthough the lime green is very pretty, more color choices would be really nice for this style of beads. Product was right on target! I am creating one curtain out of three different ones and this one is part of my project. The color is even more beautiful than on the image. At first I was worried that it might look cheap, but it does not look cheap at all. It's a beautifully beaded curtain - just what I was looking for. This beaded curtain was even prettier than the photo. It arrived in record time. I love them! The lime green is so pretty and the iridecence is awesome! My husband installed them, easy, in the doorway of my woman cave, crafting room. The rod they hang on is a different green than the beads. I would have tried to paint it but my husband installed them in such a way that the pole didn't show. Consnot really a dislike, but the header was kelly green. where I have it, you can't see the header, but if it was in a doorway the colors would clash. The color was much nicer in person. It was shiny and sparkly. Very sturdy and easy to hang! These beads are beautiful!! They are truly lime green and go perfectly with our other lime green colors in the room. Also we purchased extra sets that we needed to cut shorter. We trimmed the beads along the curved design that the large bead makes. They look really pretty and have stayed strung. ProsWe like everything about these beads ... color, quality, sparkle - all good! the picture shows it as being more of a grass green,but in fact it is just what it says,"lime green". still its very pretty and i am happy with my purchase. I hung these in an arch way in my home and I love it! They are gorgeous and the iridescent makes them sparkle and you can see hues of different colors on them when the sun or light shiines on them. Very easy to hang.